Looking over the horizon is crucial for business success. While some business forecasting is little more than fantasy, some people sometimes get it right. Futurist Faith Popcorn’s ‘cocooning’ for instance, pre-dated a revival of homey-ness in most developed countries. The Future Laboratory has in recent years focused on health and wellbeing technologies and applications and urban lifestyle enhancers – things that directly impact on quality of life. Once you start looking, there is wealth of great information out there which can help you as a business owner see ‘over the horizon’. It can be surprising how many structural and consumer preference drivers are well understood, with their impacts on business somewhat predictable (and predicted!). And it is even more surprising how much of this information is freely available to small business owners, even though it is expensive and usually commissioned by very large businesses indeed. We launched into this in the mid 2000s with the Small Business Futures workshops which brought the best of the ‘over the horizon’ forecasting and contextualised it to suit a small and regional business audience. Building the Lucky Country is a series of well-researched reports by Deloitte Access into future pathways for Australia’s economic growth. Positioning for Prosperity: Catching the next wave is the third in the series, released earlier in 2014. The report is freely available from Deloitte Access here . The report starts by looking at how much the current long period of steady economic growth has impacted on the national economy, and what will happen as the expansion phase of the mining boom comes to an end. I’ve seen evidence of this already in some communities where I’ve been working like Mackay and Singleton. Direct and indirect employment levels began falling mid last year as the big mining companies shed labour to reduce costs – essential as global prices for most of our major minerals and coal have come off their historical highs. I think many economists agree that while prices have fallen, volumes exported are still climbing, and the two together mean that the total value of mining exports may stay high. So the boom isn’t exactly over, just the labour intensive, capacity expansion phase. Deloitte Access uses this recent history to conclude that Australia does best when global opportunities match our national advantages. Mining is one such natural advantage, and discussion of another 24 advantages shapes the forecasts in the report. Global opportunity is driven by maturing economic and consumer preferences in the developing world – as the Chinese middle class, India, Southeast Asia and many South American countries move up the economic value chain to demand high value goods, and services embodying more technology and expertise. That’s half of the big picture, the demand side. The other half considers which of these types of goods and services Australia is actually good at supplying. It turns out we are globally competitive in seven of them. So what are the next big things? “As incomes rise in emerging economies, so too does kilojoule intake and, more importantly, a switch to protein takes place. The latter will power a dietary shift from grains and cereals towards meat, dairy, fruit and vegetables. That means a swing to more intensive land use. Simply put, the world is on the cusp of a leap in demand for higher-value food products. 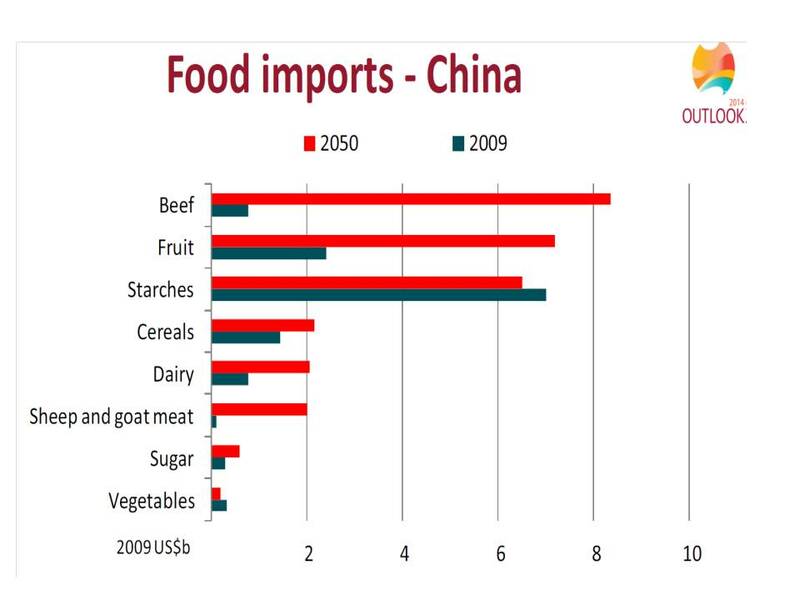 The strong demand scenario is a key part of the ABARES Outlook Forecasts this year as well, and 40-year forecasts of China’s imports of a range of important (to us) food types is shown below. The picture highlights again the shift in protein sources and scale of changing demand this will induce. Are we ready? Infrastructure gaps in transport and logistics. The resource rich regions are already well established, with the economic benefits of future growth to be concentrated in those with the capacity to adapt and expand to meet the particular needs of consumers over the next decade or two. So clean coal (low ash and sulphur) will win out over brown coal, and adaptive agriculture will win out over traditional broadacre farming. The professional services and advanced technologies are highly concentrated in the state capitals already, and only a thin slice of the growth in these industries will trickle into regional economies. So will the next waves bring yet more benefits to the parts of Australia that have flourished over the last two decades, leaving the rest of the country high and dry? Standard economics would say yes, but practical economics says no. The key to business success over the next two decades, wherever the business is located, is reading the signs, adapting into growth areas, and being part of the networks of businesses determined to ride these waves out. For regional communities and their leaders, you’ll need to energise your entrepreneurs, creating an environment where business insights are shared, networks and partnerships strengthened, and innovation becomes the norm. Markets are there to be serviced – be they the Asian middle class and all its changing needs, or the evolution of our domestic markets. Adaptation will enable a wide range of businesses in a wide range of locations to flourish. With strong demand growth forecasts, and clear competitive advantages to Australia’s national economy (and some regional economies) the biggest is risk is not ‘losing’ some economic activity to another region and ‘missing out’ on your ‘fair share’. The biggest risk is stagnating – keeping doing what the region has always done, and wondering where the customers have gone as the next waves wash over a completely different part of the economic beach. 1. Shuns complacency and adopts a sense of urgency about the need for growth. 2. Embeds long-term thinking in the way we make business decisions. 3. Reaches and maintains clarity on the right triggers for economic impact. 4. Pre-emptively skills up our people for the emerging jobs of the future. 5. Embraces diverse participation in the workforce, especially by women. 6. Achieves policy coherence across all areas of government. 7. Adopts practical mechanisms to make collaboration happen consistently. 8. Is more confident about our growth potential and future prospects. This entry was posted in Economic development, Transitions; turnaround town; rural revival; economic adaptation and tagged Deloitte Access, Economic development, economic diversification, economic sustainability, entrepreneurship, mining boom, regional development, regional economies, small business on September 23, 2014 by kimhoughton.